FauxMazzleHUD is a standalone version of the Heads Up Display used in the FauxMazzle UI because people asked for it. 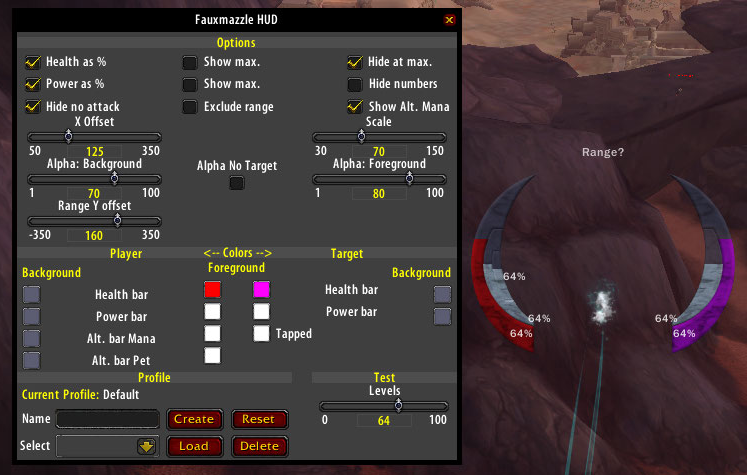 It can be used on it's own or as a replacment for the HUD in FauxMazzle without penality(just disable the internal HUD in the settings). Use /hud or /fmh to open the settings. Fix: for alternate mana display. See the Change Log (tab above) for a list of all changes. There are only three texts used in the addon "play time" that could be language localised. Donate your locale for inclusion. NoConfig - the settings window can't be opened, Default: Configuration is not available!. 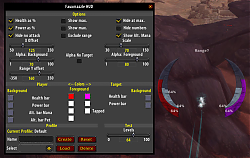 Range - to target, Default: Range (main screenshot). Unknown - range can't be determined, Default: Range? (settings screenshot). Localisations for the settings (non-play time) also accepted See the \Config\Localisations.lua file for those defaults. Thank you for the enquiry. The HUD is a part of my overall UI that people wanted to use standalone. 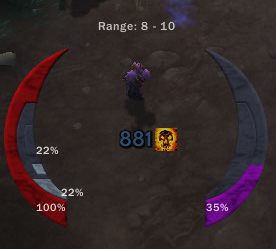 The UI itself uses Quartz for cast timers so there is no plan to add that sort functionality to the HUD. Last edited by Fizzlemizz : 03-12-19 at 07:48 PM. HI! Will there ever be the castbar for target ?